For me (and probably everyone else!) that's sympathy. I hate having to make this kind of card because it means I need to send one too. I don't really keep these cards made up as luckily I don't have to use too many. My husband needed a card to give to a friend who lost a loved one. I recently purchased the Through the trees stamp set by Papertrey Ink. 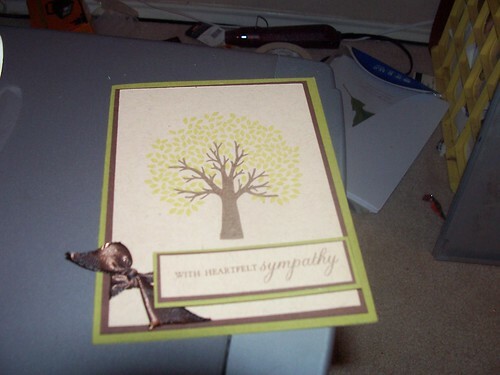 It came with a sympathy sentiment and the trees seemed appropriate and masculine enough for his friend. Normally I rely on Roses in Winter to fulfill my sympathy needs. I really like the new stamp set. This tree came in two pieces for ease of stamping and the leaves lined right up with the tree limbs. Yes, definitely the cards we don't want to make! Love your card though, it's gorgeous!